A great, free resource for American Jewish history is Carnegie-Mellon University's Pittsburgh Jewish Newspaper Project, which contains digital versions of three Philadelphia newspapers spanning the period of 1895 to the present. 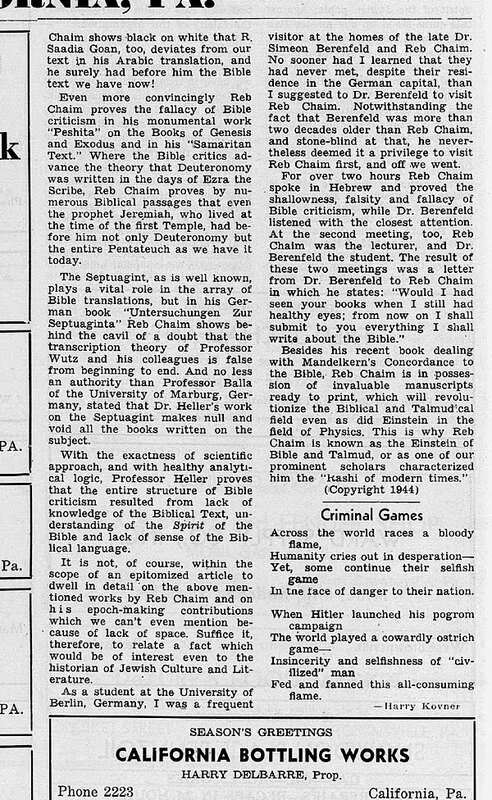 There are many treasures to be found, among them the following article about R. Chaim Heller (The Jewish Criterion, September 15, 1944). The extent of the praise is almost unbelievable, so it's fun to read. 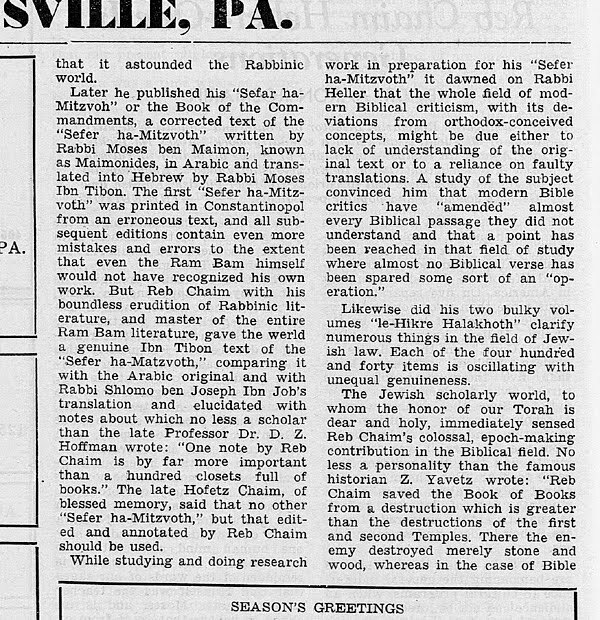 R. Heller (1879-1960) was a great influence on, as well as an elder mentor-colleague to R. Soloveitchik. Here is a brief bio, and an essay influenced by his teachings. 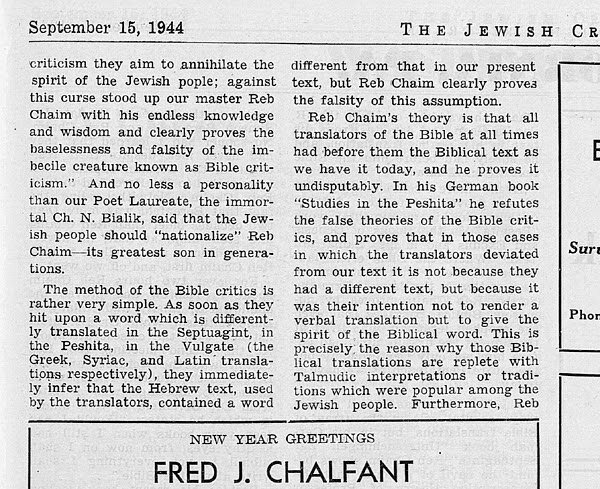 Incidentally, one looks forward to the eventual appearance of his Untersuchungen über die Peschitta zur gesamten hebräischen Bibel (1928), the text of the first two books of the Peshitta transcribed in Hebrew letters, on Google Books. 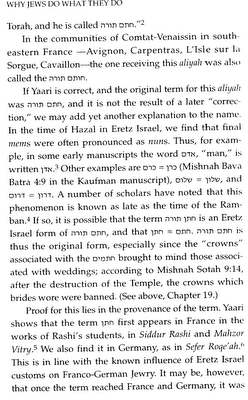 Birnbaum Siddur II: No Mei Raglayim in the Azarah, no translation in the siddur. The timidity of a prayer book from 1949. (See post I.) Perhaps the content of the post is given away by its title. The text says that Cyprus wine was used to steep the incense mixture in the Temple, to make it more pungent. However, מי רגלים mei raglayim would have been an even better mixing agent, but it wasn't decent for use in the Temple. Why not? Because it is urine. I'm sure most of us know that our relationship to human and animal waste today tends to be very different from what it was in the past. We may know of manure, but most of us don't get that close to it. And certainly we don't think of urine as a cleaning agent, but it is an excellent source of ammonia, and it was used to clean clothes and prepare dyes, among other things. Our waste disappears quickly, and its scent with it. However, urine is still urine. So even though it would have been even better than Cyprus wine, it wasn't used in the incense. 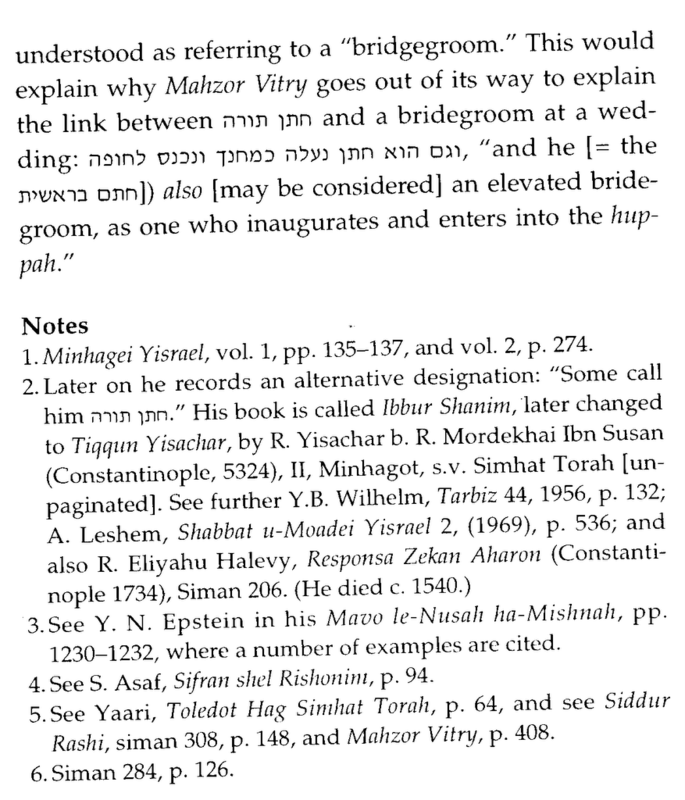 As you can see, the Birnbaum siddur delicately declines to translate mei reglayim. I really would like to compare it with other English siddurim of the period, but I cannot at the moment. 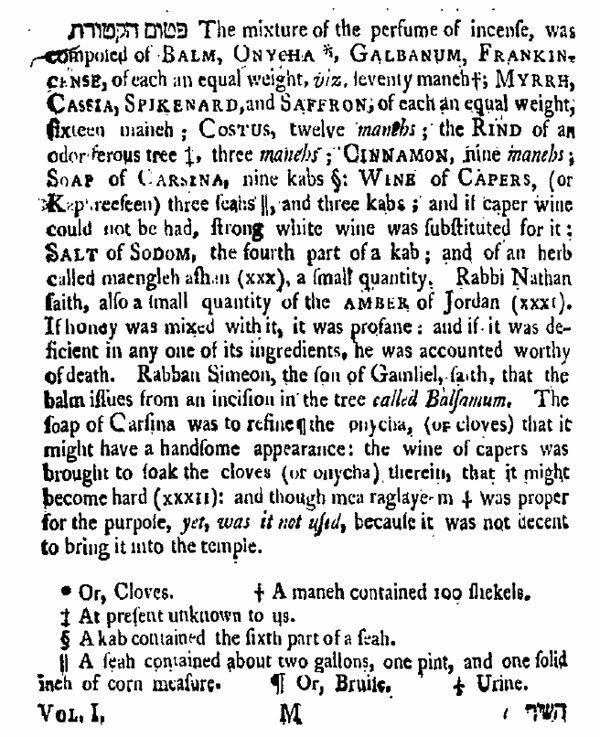 It is interesting that it too simply has mea raglayem, but a footnote says urine. If I had to guess, I'd say that in late 18th century England some people prayed in English, and David Levi, the translator, preferred to have people read mea raglayem when they prayed, but felt fine letting these people know what it meant. Obviously the sensibilities of some people in another land 150 years later are not to be found in or understood through this example. 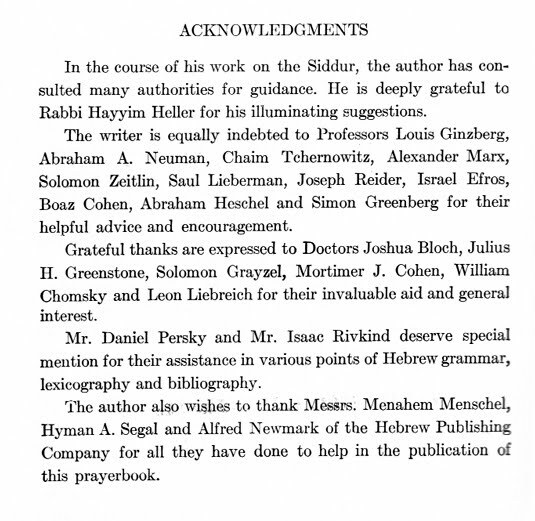 Inside the introduction (later removed) is a list of scholars which influenced him: Israel Abrahams, Seligmann Baer, Abraham Berliner, Ismar Elbogen, Louis Finkelstein, Michael Friedlander, Louis Ginzberg, Wolf Heidenheim, Abraham Idelsohn, Pool and Yaavets (at first I though this was R. Ya'akov Emden, who he quotes in the siddur, but I believe it refers to another scholar of the liturgy). 1 מחזור לשבועות כמנהג פולין The form of prayers, for the Feast of Pentecost. According to the custom of the German and Polish Jews, carefully translated from the original Hebrew. By David Levi. London 1796. The Agudah monthly The Jewish Observer has a section devoted to the problem of "Adults at-risk." In the present issue there is an article called “Will Your Grandfather be Jewish?” by R. Mordechai Becher and R. Chanan (Antony) Gordon. "What will the Rosh Yeshiva say after 120 years when he learns that his comment was one of a series of little pushes, and perhaps even “the last straw,” that eventually sent this promising student “out of the circle completely” and out of Torah observance?" "(The authors do not, of course, condone a ben Torah break-dancing or engaging in any other behavior derived from secular culture that isn't consistent with Torah value.)" This last bit was an editorial insertion, according to the author of the article." "...the JO placed it there without consulting me. Breakdancing does not bother me in the least.... just some "frum" editing by JO." The editors unaccountably sides with the Rosh Yeshiva who nudged the boy in the wrong direction, even as they print an article which offers it as an example of what not to do and a diagnosis that such an incident was indeed a cause in nurturing the phenomenon this issue is trying to counter. Read it here (without the comment that undermines the article). 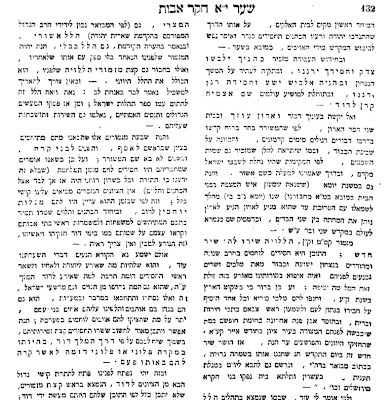 Commenter Daniel Scheide informs that the famous and controversial ספר נתיבות השלום Pentateuch, otherwise known as the Bi'ur (after its commentary), edited by Moses Mendelssohn (רמבמ"ן , רמ"ד) was digitized by Google (here). This is great. No edition of this historical Chumash was previously available online, and believe me, I looked. 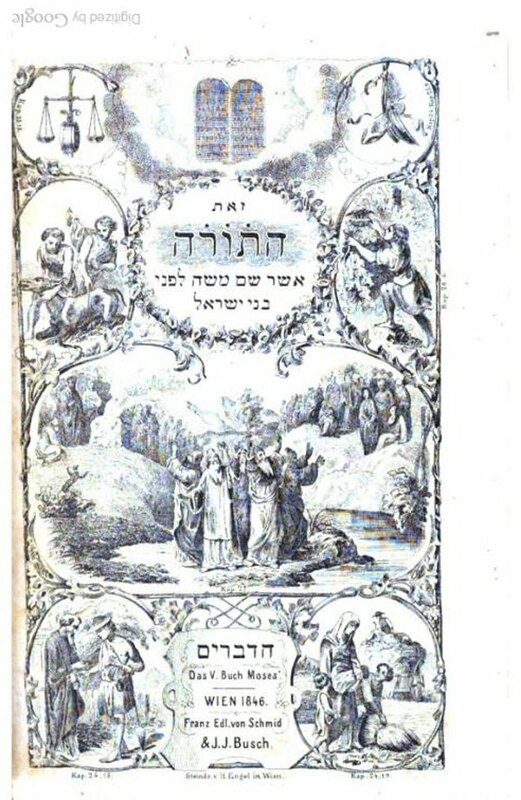 This edition, the 1846 Vienna printing includes Targum Onqelos and Rashi, which were absent in the original, but printed in many subsequent printings, as well as the Ha-mishtadel commentary by Samuel David Luzzatto and בוצר עוללות by Simon Szántó, and another appendix called הכורם. Actually, this is only the fifth volume, Deuteronomy, with Haftaros and the five Megillos. So it's upside down. It must be a sign. Perhaps Google will correct it. 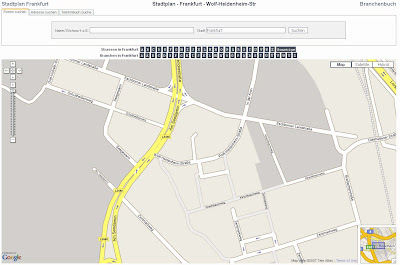 In the meantime, it's not at all impossible to download it as a PDF and correct it yourself, as I did. The Birnbaum Siddur (Ha-Siddur Ha-Shalem, 1949, edited by Philip Birnbaum used to be ubiquitous in English speaking Orthodox synagogues. Due to a variety of historical circumstances, use of this particular prayer book in synagogues has waned. Be that as it may, many still use, appreciate or at least fondly remember this siddur. In addition to its clean printing and strong binding (mine is from 1949 and in great shape), the siddur featured a fine translation, along with interesting notes that offered commentary as well as historical information about the liturgy. Birnbaum was, in my estimation, a good scholar, possessing a poetic mind, and a gifted translator. 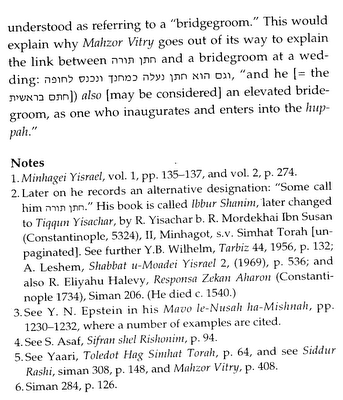 One should make no mistake, the siddur is Orthodox, despite occasional citations from Wissenschaft scholars like Zunz (these are, in any event, essential to presenting any sort of historical view of the liturgy). There is no deviation or omission from the "standard" text. Passages that could call for an apologetic or critical comment receive neither. It quotes well known homiletical explanations (like the reason for the number of knots and strings in tzitzis). 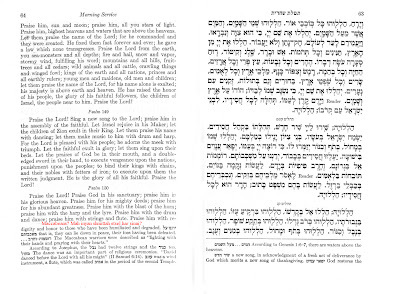 (click to enlarge) Readers will recognize this as part of the daily Pesukei De-zimra, the morning recitation of a selection of Psalms. Psalm 149 is part of that liturgy. Readers will know that according to tradition the entire book of Psalms was written by King David. More perceptive readers will know that many Psalms are ascribed to other figures, such as Moses, Assaf, the sons of Korach. Indeed, the Talmud states that the collection of Psalms include compositions by ten people, David included, who also collected them and compiled it as one book. Orthodox Judaism holds to this position, despite the presence of a psalm like 'By the rivers of Babylon, there we sat down, yea, we wept, when we remembered Zion, ' (Psalm 137), which plainly is set in the post-exilic period, centuries after David. Traditionally this psalm was (and is) seen as written by David, however with prophetic inspiration and insight. With the rise of biblical criticism in the 17th through 19th centuries, the ascription of this psalm (among others) to David became untenable. Among Jews an early figure who taught that psalms were written in the 2nd Temple period was Nachman Krochmal (Ranak). 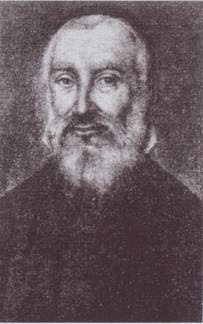 In his posthumously published Moreh Nevukhei Ha-zeman (Guide for Today's Perplexed, being one possible translation) he offers the view that many of the modern discoveries in Bible scholarship were known to the rabbis of the Talmud (proofs, as he saw it, supplied) but they explicitly taught otherwise, for the needs of their own time were better served by the older teachings. Thus, the people in the time of the Talmud were edified to think of a psalm like 'By the rivers of Babylon' as written by David, as it enhanced people's perception of divine involvement with the world, and that is why the Sages, who knew better, taught such things. These days (Ranak died in 1840) people realize that a psalm like this one was not written by David, thus it is no longer edifying or useful to maintain this view. Therefore the actual authorship of these and other psalms--which were known by the Sages--ought now be revealed and expounded, as the new knowledge and keener historical understanding is what edifies people these days. In the book there is a section which deals with the authorship of many of the psalms. Paralleling the Talmudic designation (BT Shabbos 118b) of Psalms 113-118 an 'Egyptian Hallel,' Krochmal thought that the last five psalms (146-150) also formed a unit, a 'Greek Hallel,' being that they were written in the Hasmonean period to commemorate the Maccebean victories over the Seleucids of Syria, and were in fact modeled after the Egyptian Hallel. 'The Maccabean warriors were described as "fighting with their hands and praying with their hearts.' Where do Maccabeans come into the picture? This, I submit, is a very subtle allusion to the idea that this psalm (and presumably others) were written in that period. 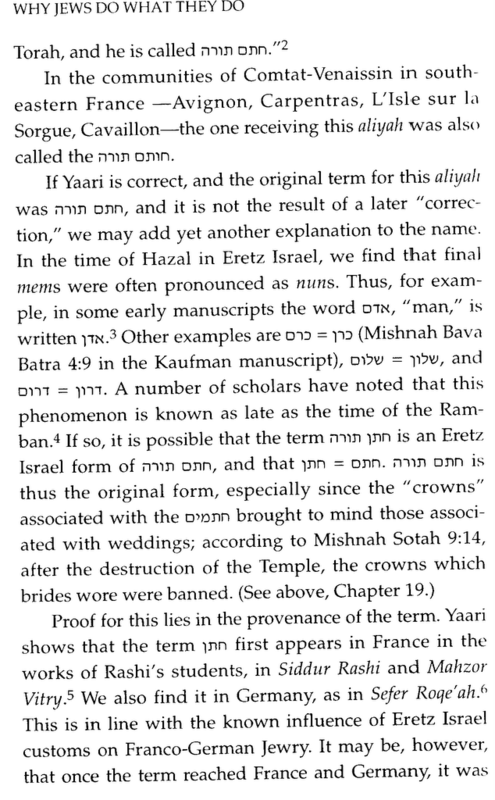 Birnbaum doesn't mention it, but the Psalm also mentions חֲסִידִים, otherwise known as Assideans, players in the Maccabean revolt. "Orthodox Judaism believes in the divine authenticity of whole Bible and knows neither of the various authors of the Pentateuch, nor of Pseudo-Isaiah, nor of Maccabean songs under the name of David, or of Solomon's Ecclesiastes from the days of the second Temple, and so forth." I quote Samson Raphael Hirsch here not because he personally was entitled to define what is and is not Orthodox, but because this post provides the context in which he wrote the above. Indeed, if we are simply describing the Orthodox position, rather than fighting for what it can encompass or may one day be, he was no doubt right. 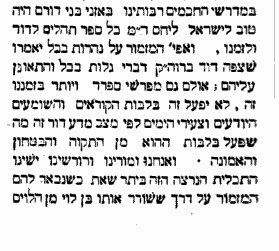 Ranak's view was unorthodox and so was Paltiel Birnbaum's comment on pages 63-64 of his Siddur Ha-shalem. 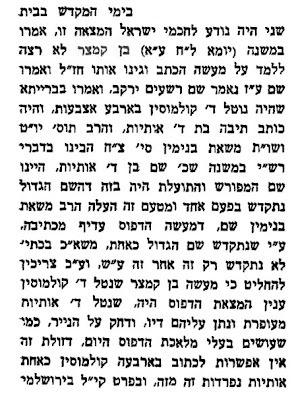 A second source for Jacob ben Chaim's conversion, reported by Shadal. A few days ago I posted about R. Eliyahu Bahur (Elijah Levita) and, invariably, the apostasy of Jacob ben Hayyim came up. I said, in the comments, that the sole evidence for this piece of information was Levita himself. However, I was mistaken. There is another source. "About Bahur's words in his poetical introduction to Massoreth Ha-massoreth: "One of the learned, whose name among Jews used to be Jacob--may his soul be wrapped in a bag with holes..."--you're asking me if I believe his intention was to say that R. Jacob ben Hayyim ibn Adoniyahu converted--it is absolutely true [ie, that is what Bahur meant]. "This matter gave me reason to delay replying to your letter, because I was really quite perturbed, since the implication of the aforementioned words of R. Elijah is that [Ibn Adoniyahu] converted, and I did not want to publicize something negative about this great scholar [Ibn Adoniyahu] before I had another witness [ie, more proof]. 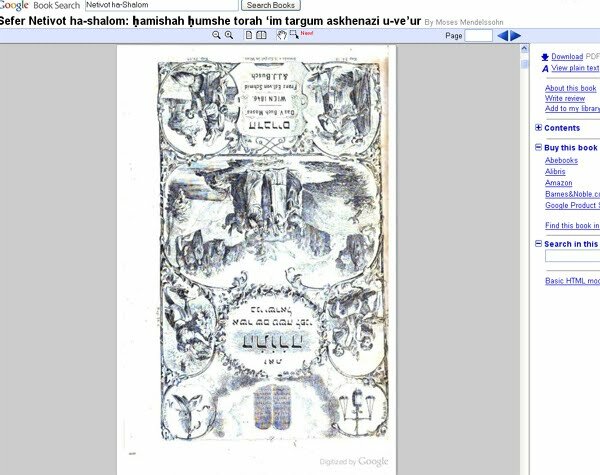 "Last year my friend, the maskil R. Moshe Soave of Venice, discovered a Mishnayos printed in Venice by Giustiniani, 1546, with the commentaries of Rambam and R. Shimshon [of Sens]. 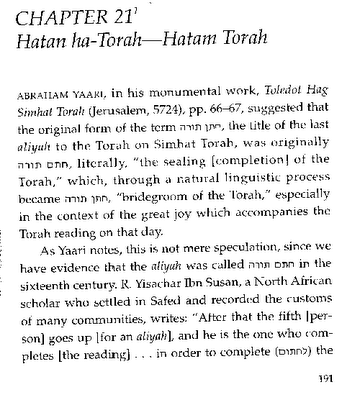 At the end of Seder Taharos the following was written (I saw it myself): "And these are the words of the first proofreader, whose name among Jews used to be Jacob bar Hayyiim, who proofread Seder Taharos with R. Shimshon's commentary. Since the Sage [ie, Maimonides] taught that the wise accept the truth from whoever speaks it, we thought it appropriate to print his words here..."
"Can you also deny this testimony, or does it establish the fact? "Before this I had been very happy when I acquired a Pentateuch with Targum, printed by Bomberg in Venice, 1543-44, at the end of which are seven pages about the Targum. They begin "Jacob ben Hayyim ben Isaac Ibn Adoniyahu says..." and I thought this showed that in the years 1543-44 he was alive--and a Jew! So how could it be that in 1538 (the year that Massoreth Ha-massoreth was printed) his soul should have been bound (ie, he'd already died)? "But when I saw this Mishnayos, what was I to think? How could I reconcile it; aren't two witnesses establishment of proof? 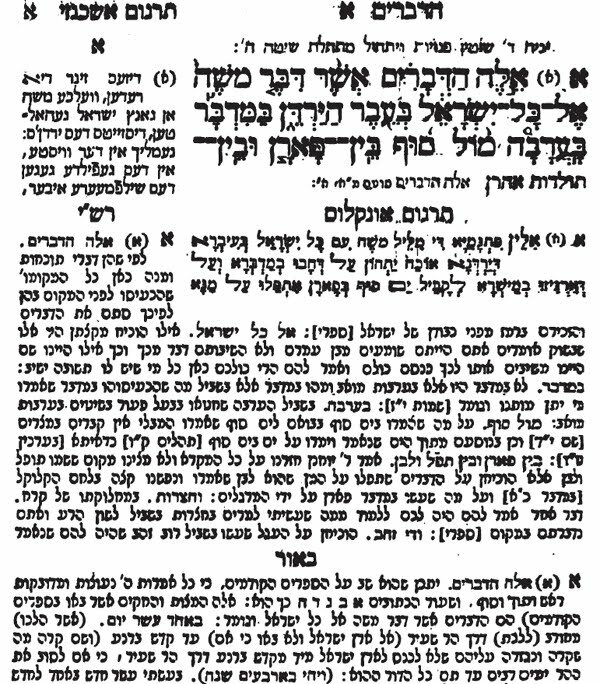 So I figured that Ibn Adoniyahu wrote his essay on the Targum while he was a Jew, and perhaps it was printed in an edition of the Pentateuch that I haven't seen, or wasn't printed during his lifetime, but was kept by Bomberg until he printed the edition of Chumash with Targum in my possession, and he printed the essay at the end. 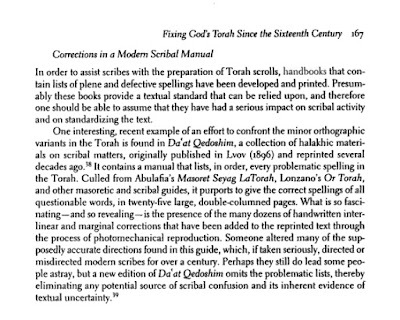 In fact, according to the Wikipedia page on Ben Hayyim, Bomberg's 1527 edition of the Chumash included the essay on the Targum, so at least one of Shadal's conjectures was correct (that it had been printed earlier, in an edition he hadn't seen; the 1527 edition). Furthermore, it may well be that he hadn't converted by 1527 (he certainly hadn't by 1525, when his famous edition was printed.) Thus, this piece of evidence which gave Shadal pause would seem to be immaterial, just as he surmised. It also must be considered - and I don't know why Shadal missed this - that the writer of these words in 1546 may have gotten his information from Levita's 1538 edition of Masoret ha-Massoret, so it's not a second witness.